The All-American Girls Professional Baseball League ran from 1943 to 1954, and was founded by Chicago Cubs owner and chewing-gum manufacturer Philip K. Wrigley as a way to maintain sports entertainment during wartime. It also gave women baseball players a proper organization in which to play, and drew nearly a million fans to the stands during its peak season in 1948. 1. ALWAYS appear in feminine attire when not actively engaged in practice or playing ball. This regulation continues through the playoffs for all, even though your team is not participating. AT NO TIME MAY A PLAYER APPEAR IN THE STANDS IN HER UNIFORM, OR WEAR SLACKS OR SHORTS IN PUBLIC. 2. Boyish bobs are not permissible and in general your hair should be well groomed at all times with longer hair preferable to short hair cuts. Lipstick should always be on. 3. Smoking or drinking is not permissible in public places. Liquor drinking will not be permissible under any circumstances. Other intoxicating drinks in limited portions with after-game meal only, will be allowed. Obscene language will not be allowed at any time. 4. All social engagements must be approved by chaperone. Legitimate requests for dates can be allowed by chaperones. 5. Jewelry must not be worn during game or practice, regardless of type. 6. All living quarters and eating places must be approved by the chaperones. No player shall change her residence without the permission of the chaperone. 7. For emergency purposes, it is necessary that you leave notice of your whereabouts and your home phone. 8. Each club will establish a satisfactory place to eat, and a time when all members must be in their individual rooms. In general, the lapse of time will be two hours after the finish of the last game, but in no case later than 12:30 a.m. Players must respect hotel regulations as to other guests after this hour, maintaining conduct in accordance with high standards set by the league. 9. Always carry your employee's pass as a means of identification for entering the various parks. This pass is NOT transferable. 10. Relatives, friends, and visitors are not allowed on the bench at any time. 11. Due to shortage of equipment, baseballs must not be given as souvenirs without permission from the Management. 12. 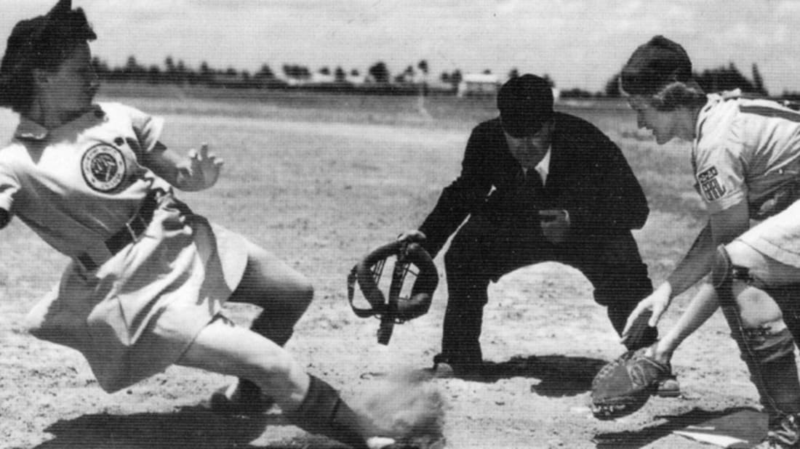 Baseball uniform skirts shall not be shorter than six inches above the knee-cap. 13. In order to sustain the complete spirit of rivalry between clubs, the members of different clubs must not fraternize at any time during the season. After the opening day of the season, fraternizing will be subject to heavy penalties. This also means in particular, room parties, auto trips to out of the way eating places, etc. However, friendly discussions in lobbies with opposing players are permissible . Players should never approach the opposing manager or chaperone about being transferred. 14. When traveling, the members of the clubs must be at the station thirty minutes before departure time. Anyone missing her arranged transportation will have to pay her own fare. 15. Players will not be allowed to drive their cars past their city's limits without the special permission of their manager. Each team will travel as a unit via method of travel provided for the league. Punishment for breaking any of the League Rules of Conduct manifested as a $5 fine for the first offense, $10 for the second, and suspension for the third.